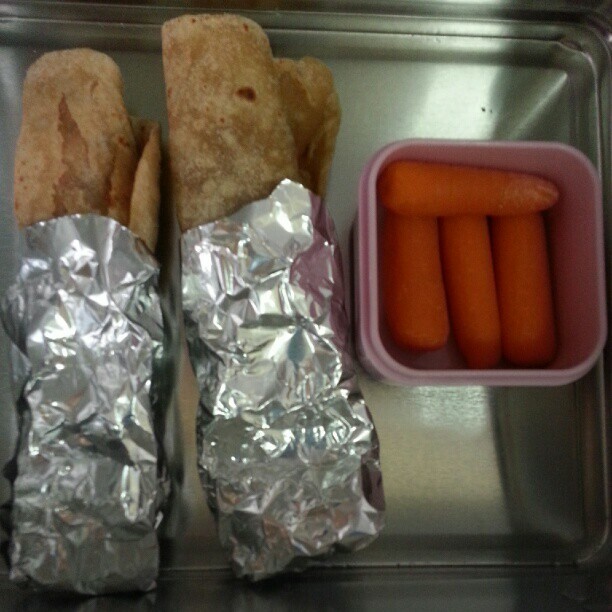 When end of summer holidays came nearer and nearer, I realized that it was time to start planning his lunchbox. I had decided not to rely on Nutella spread anymore as the the moment he sees a jar of Nutella, that's all he eats! I also wanted to do something more creative and fun this year. After pinning few ideas I found on web, I thought it would be fun to give myself a two weeks' challenge and see whether I can last without nutella or jam. I'am happy to report that I did very well. And best part of this challenge was that on most days, Talha's lunchbox came home empty or atleast half-eaten. Not bad right? So here are seven different ideas that worked for Talha and I think it would work for your children too. Pardon my blurry photos as during the morning rush I can only take phone photos. 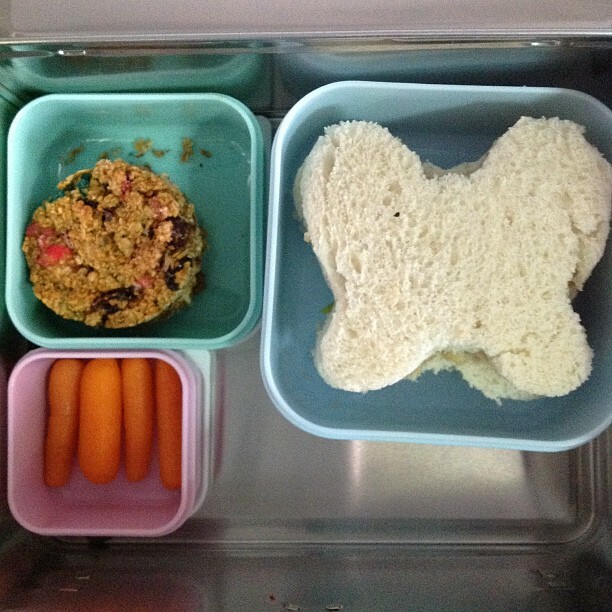 For his first day at school, I made regular roast chicken sandwich. I used a butterfly shaped sandwich cutter to make it look cute. I had made MnM granola using the recipe here on the previous night. He loves baby carrots and so he got some. I usually make some noodles using chicken and whatever vegetables I've in stock. I do not use the masala that comes in the pack as it contains MSG. A quick saute of veggies and leftover chicken with some soy sauce or similiar sauces added to cooked Maggi and you are good to go. I also added some baby carrots and sliced apples. I haven't made chicken burger in a long time. No, I didn't make it from scratch. It's the frozen version. I know it's not exactly heatlhy. But hey, he is only four and half years old. I do have to give him a break once in a while. I filled the burger with some iceberg lettuce and tomatoes. Talha had bought himself a pack of tortilla chips when we went grocery shopping and wanted a box for himself and his best bud Modi. I obliged. I also kept a small box raisins. This was a huge hit! I don't know whether it was the burger or chips or the combination. All boxes (except for few raisins) came home empty. Quesadillas are super easy to make and popular among both children and adults. You could follow this recipe by Nigella Lawson or whip up your own like I do. Spanish Chicken Rice is a dish I discovered through a friend and is very popular at home. I made some for dinner the previous night and reheated in a frying pan the next morning. The reason why I'am specifying 'frying pan' here is because rice dishes like this and biryani always tastes better the next day especially when reheated on a frying pan. The oatmeal cookies recipe is from Anja's Food for Thought and can be found here. It's super simple and yummy! I saved this dish for the last as this is the dish I'am most proud of. The most proud of. Kebab may sound time consuming and difficult. But it really isn't. I marinated the chicken pieces and squared red and yellow bell peppers and zuchini a day earlier. All I had to do in the morning was to feed them on the skewer and throw them in my oven. I kept the kebab with the skewer so that Talha knew what it was and hopefully get him excited. I did cut off the edges of the skewers just to be safe. 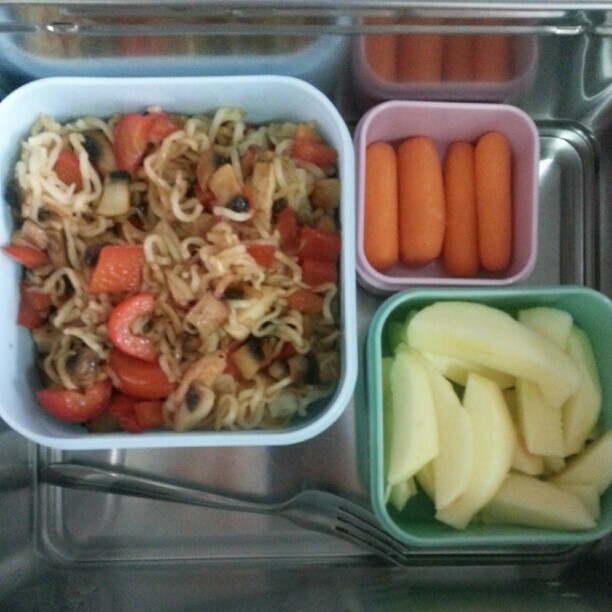 I also gave him some plain yoghurt as dip, couple of sliced baby carrots and chopped mangoes. Everything, except yoghurt, came home empty. Hoorray!!! Recipe for the kebab can be found here. I hope these seven dishes has given you some ideas. 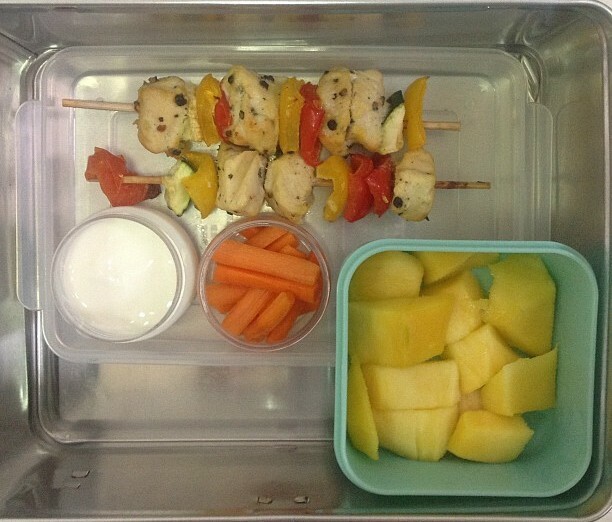 These dishes can be used in your or your spouse's lunchbox too. In J's case I switch white bread with brown bread. Rest of the things remains the same. 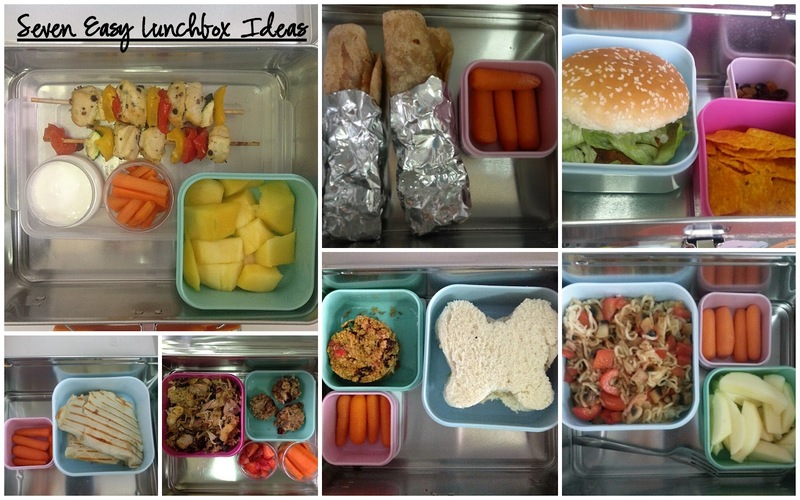 Being organized and getting creative are (the only) two ways to make lunchboxes fun and get our children eat more of healthy food. Almost everyday I pin a recipe or two onto my pinboard. Recently, I organized my pinboards and created several categories to find recipes easily. Every Friday when I sit down to make my grocery list, I go through my boards several times looking for inspiration and trying to remember the ingredients I had planned to purchase. 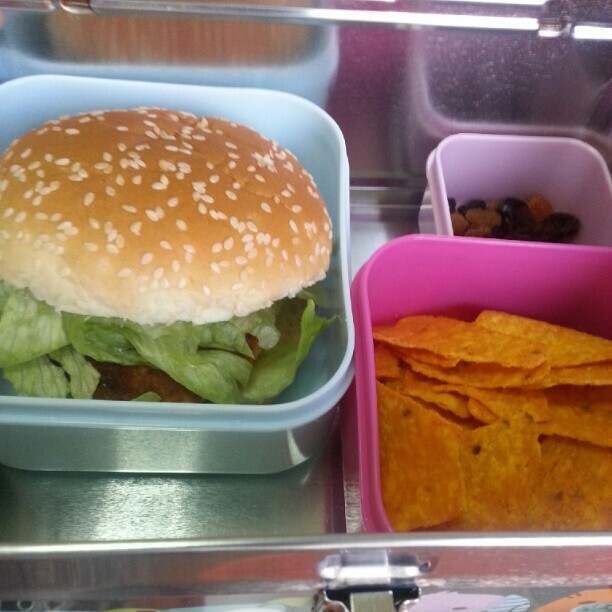 I will try and add more lunchbox ideas and recipes here. Until then, let us stay inspired and creative. PS. This post has been in drafts for over ten days. Couple of days back we received a memo from Talha's school informing us that they have gone 'nut free', which means I cannot send anymore of those delicious granola or oatmeal cookies with him. Which, in turn, means, I've to get even more creative now. Fun days ahead!! 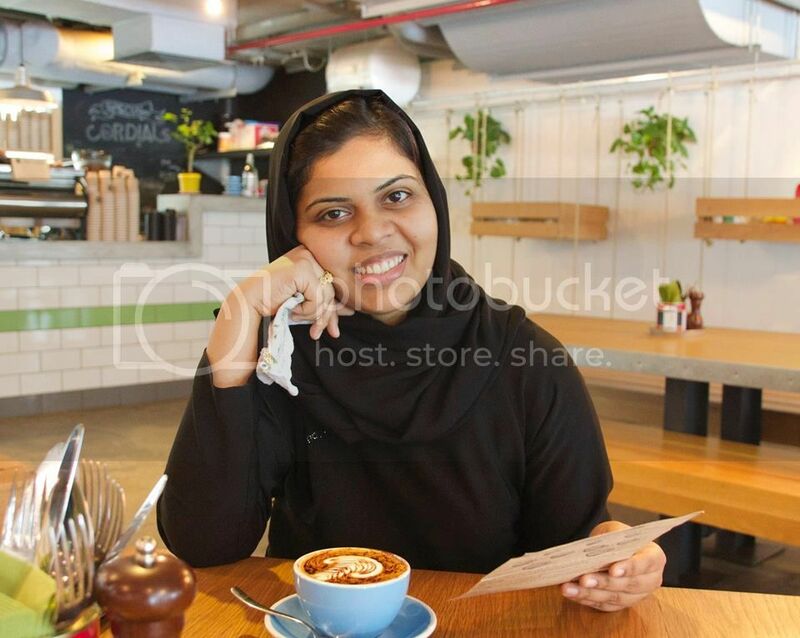 Neelu...supermom...you deserve a standing ovation..It was a lovely post with yummy pictures...Keep up.. Thank you Nima :) You are very kind. 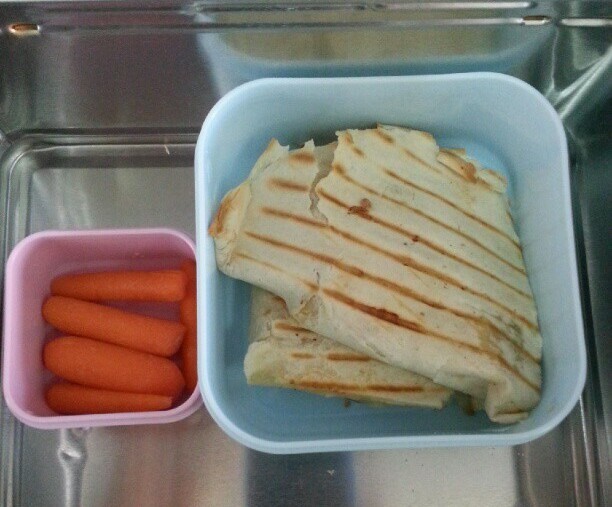 Oh boy, I wish I'm the one going to school with all those lovely lunches!! They look really appetizing, Neelu! They look very good and I'm in desperate need of some inspiration like this. Wish I was still going to school n I had a Mum like you who would pack my lunchboxes!!! guilty with nutella spread & cereal bar for school snack. 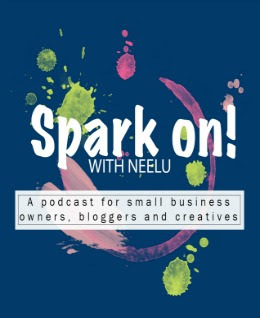 ery nice..I am so proud of you Neelu, everybody knows it..but making it real is all what it is!! 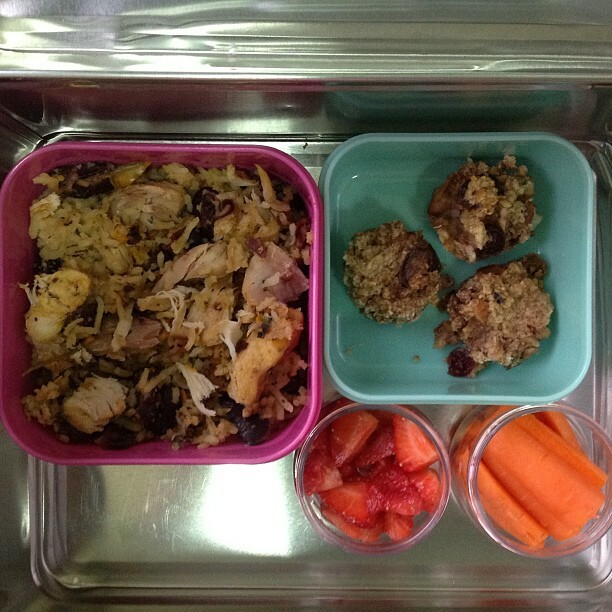 Your lunch boxes..are so close to my heart..so goes into.. my family plate most of the time..if not everyday!